The progression of addiction took me to a place I could never have comprehended the first time I picked up a substance. I was a part of the Oxycontin boom. I literally went from trying Oxycontin to using heroin and a hypodermic needle. It was like someone hit a fast forward button. I went from partying and socially using to living on the street. I was labelled as a junkie. Nobody wanted me around. It was a very dark, confusing, and lonely time. I knew that what I was doing was terrible but the pain wasn’t great enough to stop. Most of my friends were going to college and I was out every day trying to find money to get high. Around my eighteenth birthday, I got arrested for robbing my friend’s house. I ended up getting forced into treatment. 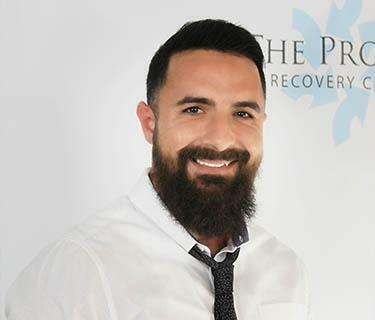 I got exposed to the 12 Step fellowship and to younger people in recovery. When I was nineteen, I stayed in a holding facility in Tewksbury, MA. A 12 Step commitment came in. There were a bunch of young guys from South Boston. The message wasn’t about drinking. It was about changing internally and finding a freedom that doesn’t come from external circumstances. The speaker was no longer suffering from fear, doubt, and insecurity. He was no longer letting fear dictate what he was going to do with his life. He talked about self esteem and happiness. He said we have to take action in order to acquire these things. His message resonated with me. I had heard other people talk about how they got their car back or they got their wife back. I didn’t care about accumulating anything. I hated myself and I had so much self-loathing. The only thing I wanted was an internal change. I didn’t want to feel the way I felt anymore. Something changed inside of me. I didn’t get clean but I became fascinated with 12 Step recovery. I started to think: “Hey, maybe I’ll give this a chance”. I began an endless cycle of going to half-way houses and treatment programs. I was confused because I mistook looking good with actually doing good. I put on some weight, I got some clothes, I got a job, and I was doing what I needed to do in my treatment centers. I found that I could graduate a program but within weeks or months I would relapse. I’d have to start over. It took time clean – when I finally got it – to realize I could flourish in treatment because you took my thinking out of the equation and inserted someone else’s thinking instead. I was no longer making decisions for myself. Somebody else told me when to wake up, when to be home, when to eat, when to smoke, and what meetings to go to. When I graduated, my thinking was inserted back into the equation…and I had done nothing to change. I didn’t insert myself in outside meetings. I had never done the Step work. I had never done a true spiritual process of growth and change. I hadn’t formed the ability to be completely honest with somebody. I was never truly accountable. Although I constantly relapsed, I continued to try. I got clean for good at twenty-two. From twenty-two until around twenty-four, I learned the difference between being clean and being in recovery. We have a disease that gets us to chase. We don’t need to do drugs to be actively using. My disease has the ability to take anything in my life that makes me feel good and turn it into a drug. I can create unmanageability and spiritual bottoms without picking up. I put stipulations on my happiness. I told myself: “When I arrive at this point, I’ll finally be happy. When I accumulate this, I’ll finally be happy”. I was looking for something to fix me just like I did with drugs. I found myself with all this stuff – I had a car, I had an apartment, I had a job in the Roofer’s Union, I had a girl, I had clothes, I had a gym membership, I had a tanning membership – but I was more miserable than I had ever been in my entire life. I no longer had an excuse for being depressed and full of fear, doubt, and insecurity. I could no longer blame the way I felt on drugs or the circumstances of my life. I couldn’t use the victim mentality. I become a chameleon. I was whoever I needed to be in certain situations. What other people thought of me was more important than what I thought of me. It was a very crucial point for me. I was teetering, asking: “Do I even want to stay clean anymore?” But then everything changed. I got a phone call from my mother. Something was going on with my stepfather. My mom said: “He’s in the hospital now, but I don’t know, Chris, I have a bad feeling. Something’s not right. They’re keeping him overnight”. My stepfather didn’t drink, didn’t smoke, didn’t do anything wrong…he just got up and went to work. He was in perfect health. They ran all these tests and they were concerned because they didn’t know what was going on. They did a scan of his brain and they saw some shadows. It looked like cancer but they didn’t know for sure. They had to do a brain biopsy and he had to go under anesthesia. We all went to the hospital before his surgery. As I was leaving, I said “Bye. I love you, Dad,” and I shook his hand. We had just started building a relationship again because I was clean. He squeezed my hand and he pulled me back and he said: “You know I love you, right?” And I said: “Yeah, of course.” And he said: “You know I love you, right?” And I said: “Yeah”. It was such a weird moment because I didn’t know. I had always struggled with that. My brothers were actually his sons and I was his stepson…and I was so bad when I was younger. He made it a point to tell me he loved me. It’s like he knew I needed to hear it. That night, he went under and he passed away. That was my last conversation with him. My whole life flipped upside down. My mother and my brothers were devastated and they were all looking to me for strength. I looked like I was strong on the outside but no one knew what was actually going on with me inside. God intervened in my life. I used to go to meetings and hear this guy named Joe share. I couldn’t stand him. He was happy and he loved recovery. I didn’t. I used to judge him and I hated his guts. I never wanted him to be around. He used to hang out with my friend Keith. The night after my father died, I was sitting in my kitchen and Keith came home. He was with Joe. I was crying at the table. Joe came in the kitchen and he said: “Hey, do you want to go to a meeting tonight?” I hadn’t been to a meeting in awhile. Everything inside me said “No,” but when I opened up my mouth, I said “Yeah”. He picked me up that night and brought me to a men’s meeting. I raised my hand and I lost it. I told them everything that was going on. There was another man there named Nate. He had just gone through loss and he was very active in 12 Step recovery. He called and invited me to hear him speak. I connected with his message the same way I had in Tewksbury years earlier. I asked Nate if he would be my sponsor and he brought me through the steps. That’s where everything began for me. I developed the ability to be honest and I started to finally reap the true reward of recovery: freedom. After that, I devoted myself to finding guys like me. I try to give them hope. I try to help them open their minds and their hearts to this process and let them know that they can change. Not only can we get clean and stay clean, but we can go on to live amazing lives. I believe in the “one day at a time philosophy”, but I always like to ask: “If you could write the script of your life, what would it look like? What’s the perfect scenario? What is the perfect emotional mindset, the perfect house, the perfect job…What does that life look like to you?” Most people can’t answer those questions because they don’t think like that. They don’t believe the ideal life is possible. It is very possible. I believe when you start to think in those terms, you start to view your disease as not just talking you out of staying clean in the moment but as talking you out of that beautiful dream and that beautiful life. When we expand our minds to imagine that life, it becomes a lot harder to say “no” to getting clean and a lot easier to say “yes” to recovery. My life is an example of that. I followed a dream to dance when I was twenty-five. Most kids have danced their whole life. Not only did I succeed, but I ended up traveling and appearing on MTV. I opened a dance school, 9 sober houses, and a treatment center. The common denominator is my recovery, my faith in this process, and my faith in God. I’ve been very vocal and I don’t hide who I am. Addiction isn’t a choice. When I was ten years old, I didn’t think: “I can’t wait to grow up and be a heroin addict”. Whenever I was judgmental or critical, my mother always used to say: “There but for the grace of God go I”. We are never to pass judgment on anyone’s circumstances because, the truth is, we don’t know what leads people to where they are in life. My mother has two children who suffer from this disease and two children who don’t. There was no difference in the kind of mother she was. We were born this way. Be careful who you judge and be open minded. A lot of people are misinformed about addiction. Some of the most amazing people are addicts.